The new logo for the "Space Shuttle Atlantis" exhibit is unveiled by astronaut Jon McBride (left), Delaware North President Rick Abramson and Bill Moore, chief operating officer of the Kennedy Space Center Visitor Complex in Florida on Feb. 21, 2013. NASA's final space shuttle to fly in space will be exhibited to the public in a facility that bears simply the retired orbiter's name, officials announced on Thursday (Feb. 21). NASA's Kennedy Space Center Visitor Complex in Florida, which will host the retired shuttle Atlantis, also revealed the logo for its new 90,000 square-foot, $100 million "Space Shuttle Atlantis" exhibit, which will be used on monument signage at the entrance and on a variety of retail merchandise, marketing and promotional materials when the building opens to the public on June 29. "Although the multimillion-dollar interactive exhibit encompasses much, much more than the display of Atlantis, there is no denying she is truly the star of the show," said Bill Moore, chief operating officer of the visitor complex. NASA retired its veteran shuttle fleet in July 2011, after Atlantis flew the 30-year shuttle program's 135th and final mission. The space agency then awarded the orbitersto museums and science centers in Virginia, New York and California, but decided to keep Atlantis for its own Florida spaceport public attraction. NASA and Delaware North Companies Parks and Resorts, the company contracted by the space agency to operate the visitor complex at no taxpayer expense, worked with the St. Louis design firm PGAV Destinations to develop the name and logo for Atlantis' display. "We know that this majestic beauty, which safely ferried men and women to space and back on 33 successful missions, is the real reason that our guests will travel thousands of miles, across oceans and across continents to visit Kennedy Space Center Visitor Complex to see her in all her glory," Moore said of Atlantis. "There are no words to accurately describe the emotions and insights guests will gain when this attraction opens this summer, for there has truly never been anything like it before. Therefore, we decided to be true to the heart and soul of the exhibit and name it simply and reverently, 'Space Shuttle Atlantis,'" he said. According to Mike Konzen with PGAV Destinations, the exhibit's logo was created using a gradient of fiery oranges to represent the space shuttle's launch and re-entry into Earth's atmosphere. These symbolic colors were also used in the metallic "swish" to represent the re-entry of the shuttle on the outside of the orbiter's new building. The light-to-dark range in the logo's lettering is meant to convey the excitement and drama of the shuttle program while the iconic silhouette of the orbiter, or shuttle, is used to represent the "A" in Atlantis. The NASA insignia — or, as it is affectionately referred to, the "meatball" — serves as a reminder in the logo of the "pride and patriotism" in America's space program, while "Kennedy Space Center" pays tribute to the birthplace of the United States' spaceflight efforts and the launch site for each of the shuttle program's 135 missions. Space shuttle Atlantis, as seen shrink wrapped and angled for its display in the "Space Shuttle Atlantis" building, Feb. 21, 2013. The visitor complex broke ground for the "Space Shuttle Atlantis" exhibit in January 2012. Atlantis itself was rolled the short distance from its former Kennedy Space Center processing facilities to its display facility 11 months later. 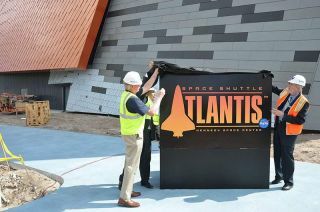 Thursday's reveal of the name and logo, as well as the opening date, marked the latest milestone since Atlantis arrived in the six-story building, was raised off the ground on its display pedestals and then was wrapped in plastic to protect it from gathering dust as the final construction of the building and exhibit continued. The next milestone is scheduled to begin next month, with the installation of full-scale replicas of the shuttle external fuel tank and twin solid rocket boosters at the entry to the "Space Shuttle Atlantis" exhibit. These components of the space shuttle "stack" will serve as a gateway, with guests walking beneath the massive orange tank, which will be suspended 24 feet (7 meters) above the ground and will be mounted between the two white rocket boosters that reach 185 feet (56 meters) into the air. Installation of the entryway structure is slated to be completed by June. Construction continues on schedule inside the exhibit as well. In May, Atlantis will be uncovered from its protective shrink wrap. The orbiter's cargo bay doors will be opened and a full-scale model of the Hubble Space Telescope will be installed inside the building along with some 60 other exhibits and artifacts. Atlantis' replica Canadarm robotic manipulator, or arm, will also be extended and suspended from the 115-foot tall (35 meter) ceiling. The "Space Shuttle Atlantis" exhibit presents the shuttle at a tilt of 43.21 degrees, showcasing Atlantis as if it were in space. Guests will view Atlantis as only the astronauts from its 33 missions have previously had a chance to see it from their vantage aboard the International Space Station.